So Yahoo web search, the organic results, are now powered by Bing, Microsoft search. The next to fall is the paid search side of things. Yahoo announced yesterday that the beginning of the end for Panama, Yahoo's Search Marketing platform. It is the beginning end of Yahoo powering their own search ads on their own search interface. Folks at WebmasterWorld are calling it a "merge." The big paid search merge? Well, not really, more like the "big dig" for Yahoo. 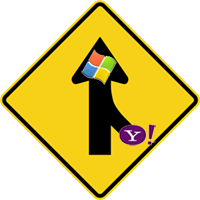 Yahoo isn't necessarily merging their technology with Microsoft, they are telling their advertisers to get their campaigns set up in Microsoft adCenter because Yahoo is burying their software likely by the end of October (in the US and Canada). 1) Prepare your account for transition to adCenter When you log into your Yahoo! Search Marketing account, you’ll automatically be taken to a new tab labeled “adCenter.” We recommend that you review your Compatibility Report, and fix incompatibilities between your current Yahoo! campaigns and the adCenter platform before starting the transition to adCenter. 2) Transition your account to adCenter When you begin your transition, you’ll be able to create a new adCenter account, or indicate that you have an existing adCenter account that you want to continue to use. If you choose, you can use the transition tool to copy your Yahoo! Search Marketing campaigns over to adCenter. Please note that your campaigns will retain the same status (active or paused) as they have within your Yahoo! account, so you may start incurring click charges for Bing traffic right away. 3) Continue to manage your Yahoo! Search Marketing account The last stage in the transition process will occur when Yahoo! Search ad serving moves to adCenter, which we expect to begin in mid-October and be completed by the end of October. During this period, you should expect traffic from your Yahoo! Search Marketing account to decrease, and increase in your adCenter account. But until this process is complete, you’ll still need to actively manage your Yahoo! Search Marketing account to have your ads displayed on Yahoo! and our partner sites.